This is the third volume in a seven-volume collection - published in nine parts between 1864 and 1890 - comprising Venetian and other northern Italian state papers relating to England. Translator and editor Rawdon Lubbock Brown (1806-83) lived for many years in Venice, had unrivalled access to the Venetian archives and travelled widely to find documents in other Italian libraries and archives. He had previously published two volumes of Sebastian Giustinian's dispatches to Venice from Henry VIII's court (also reissued in this series). This third volume contains documents from the years 1520-26, a time when Henry VIII was a powerful figure in European politics: his meeting with the king of France at the Field of the Cloth of Gold is recounted here. 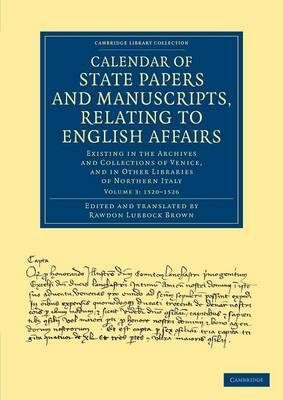 The editor's preface puts the various documents into historical context, and there is also an appendix of miscellaneous items, including papal letters.